The music of Murray Gold will be familar to a large part of the UK audience since he has contributed to a number of very popular television shows, including those icons of BBC programming, Doctor Who and "Blue Peter". Gold was born in Portsmouth and started his career as a writer for radio and the theatre, before making his mark as a composer. In that latter capacity he has provided the music for a number of films including "Beautiful Creatures", "Wild About Harry", "Miranda" and "Death at a Funeral", and several television productions including "Vanity Fair", "Hawking" and "Shameless", and has been nominated several times by BAFTA for his original music for television. Much of his most well-known television work has been in collaboration with writer and producer Russel T Davies. Gold's collaboration with Davies started with "Queer as Folk" (1 and 2) and included "The Second Coming" and "Casanova" before taking on the busy role of music director for the new revamped series of "Doctor Who". 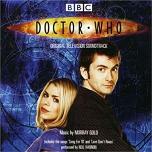 The music of the original Doctor Who series has always been innovative, particular in its use of electronic sounds, but when the series returned with a fresh look in 2005 it had a more cinematic quality both with larger-budget effects and with a stronger emotional connection to its audience. This demanded a new approach to the music and Murray has frequently used a large orchestral sound with the help of the BBC National Orchestra of Wales and orchestrator and conductor Ben Foster. 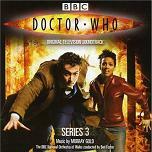 The music has such an intimate association with the series, that a special concert event was held in November 2006 in Wales' capital city of Cardiff, and similar Doctor Who Prom Concerts held in London's Royal Albert Hall in 2008, 2010 and 2013. The latest version of the shows is completely dedicated to Gold's music the the TV series and called the Doctor Who Symphonic Spectacular. The new Doctor Who series has included a number of Christmas Special episodes and also spawned two spin-off series - a more adult series called Torchwood (an anagram of "Doctor Who") and a series aimed at children of all ages called "The Sarah Jane Adventures" which features one of the best-loved companions of the Doctor. Murray Gold himself has featured in a cameo part in the Doctor Who 2007 Christmas Special episode "Voyage of the Damned" which also featured the singer and actress Kylie Minoque in a non-singing part. The story had a spaceship in the shape of the original Titanic and Gold was one of the players in the band playing on board the futuristic liner. See also our overviews of the growing number of Doctor Who music albums - including Series 1 and 2, Series 3, Series 4, Series 4 The Specials and Series 5, and our article on Electronic Music which describes how the original theme music was constructed by Delia Derbyshire at the BBC Radiophonic Workshop. In addition to his work as a composer, Gold has also written a number of plays including "Electricity" one of whose productions starred former Doctor Who Christopher Eccleston. Gold has recently written a musical play where a dying Franz Kafka plays himself (or in true kafkaesque style, imagines playing himself) in a musical about himself. A production of "Kafka: The Musical" was broadcast on BBC Radio 3 and this starred another former Doctor David Tennant as Franz Kafka. Gold's piece "When My Brother Fell Into The River" was recently given its world premiere at London's Barbican Centre as part of the Crouch End Festival Chorus 30th Anniversary Year celebrations. In addition to numerous classical and other recordings and appearances, The Crouch End Festival Chorus have frequently performed the choral music heard on certain episodes of Doctor Who. Gold will be composing the music for former Doctor Who showrunner Russell T Davies' adaptation of Shakespeare's A Midsummer Night's Dream which is due to be shown by BBC 1 in 2016, and also for BalletLorent's production of Snow White. It was announced in 2018 that Murray Gold (along with the core cast and crew) would be leaving Doctor Who. Segun Akinola will be the new Doctor Who composer. 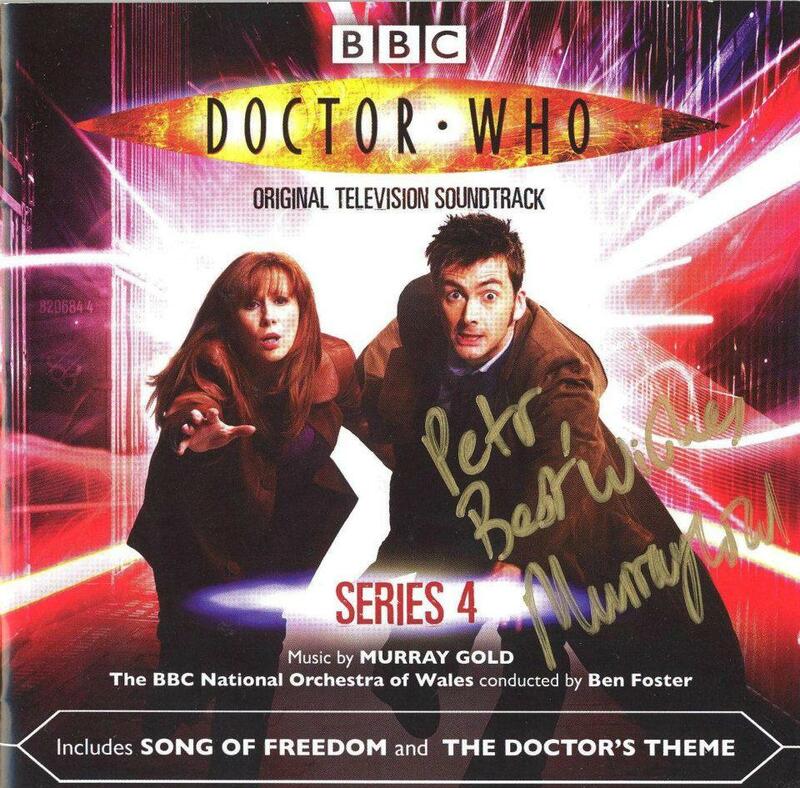 Torchwood - theme for Doctor Who spin-off with most episodes scored by Ben Foster, however Gold is taking over from Foster (and assisted by Stu Kennedy) for the 10-episode series (largely set in the US) called "Torchwood: Miracle Day"
Here is a CD cover signed by Murray Gold. Our thanks to Petr Kocanda for permission to use his collection of autographed CDs. Click the thumbnail below to see the image full size in a separate window.